accompanying illustrations; as well as to panels, pilasters, friezes, drawer-fronts, and the like. In order to convey a more adequate idea of the character of these frets than we can glean from the necessarily impressionistic indication of them in the sketches of complete pieces of furniture, I have had a number drawn to a larger scale, and included with other characteristic detail on Plate VIII. 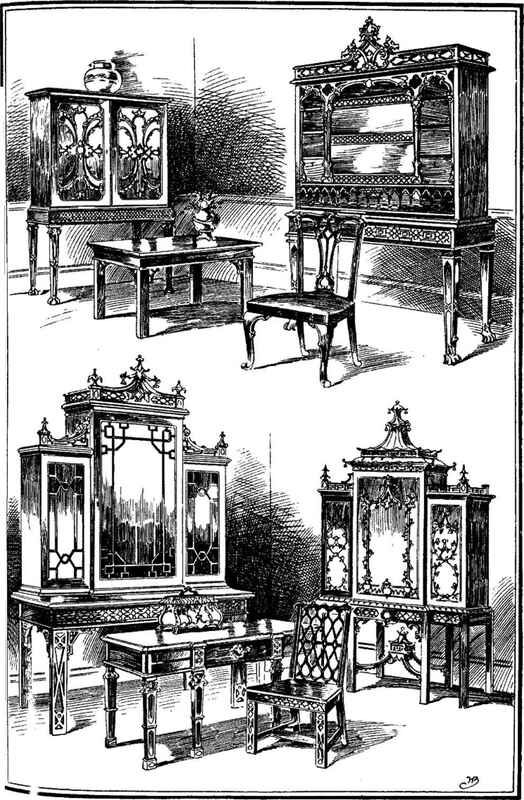 I have mentioned that this designer, during his search in all manner of different fields for ideas, coquetted now and again with the Gothic, or "Gothick" as he preferred to call it; but that old style failed to gain his favour to any great extent, or maybe it proved too severe for him, and unrelentingly resisted his advances. Be that as it may, he did not make much progress in that direction; but we must see what he did manage to do. In Fig. 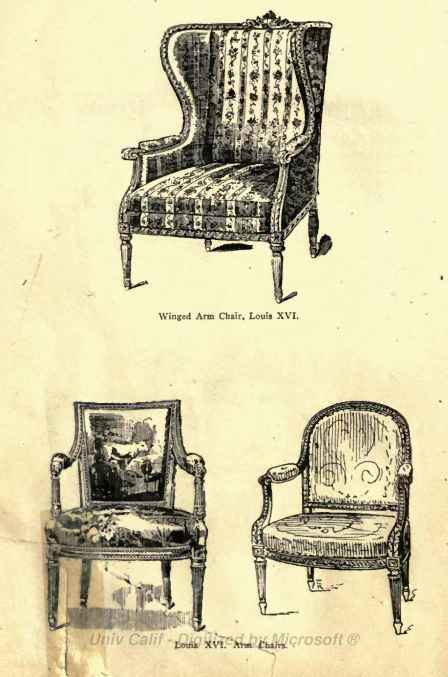 12, Plate VIII., just the end of a " Chippendale-Gothic" commode appears, which, we must admit, is not altogether devoid of a certain quaint charm; while a touch of the same feeling is present in the press or cabinet 011 Plate VI. (as also in one or two other examples), though here it is mixed up with French and other detail of a hybrid nature. With these few pieces of " Chippendale-Gothic" before us, however, we do not experience any very keen regret that their originator did not proceed much further on those lines. Reverting, for a moment, to the frets, it is important to point out that they are almost always purely geometrical, and therefore repetitive, in design, consisting principally of a succession of rectangular repeating figures, so interwoven one with another as to present an appearance of great intricacy. Curves of any kind were not often introduced into them, though they do occur in some cases. In these we find ovals, circles, and segments of such figures, as in Fig. i, Plate VIII. The student and collector will do well to bear this characteristic in mind, as its remembrance is a great aid to identification.